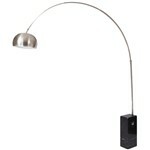 Mid-century modern design, this decorative arc light will brighten any room with its refined style. A thick Italian Marble base holds the tall stainless steel arm in place while a white reflective shade interior adds a warm glow to any room you decide to place it in. The base of light source travels from one part of the room and spans to its desired location all while adding a modern flair. More often than not, iconic pieces like the arched Arco Lamp take hold and become classics-not on looks alone, but by offering practical solutions to design difficulties. Marble Base Dimension : Height 21.5" x Length 9.3" x Width 7"
Adjustable Full Pole Height 93" - 96"
Solid, slightly brushed pivoting Stainless Steel hood with reflective interior. 126 individual holes in aluminum heat diffuser located at the top of the hood.